Our language, it has been argued, is deteriorating day by day. The advent of another 21st February is bringing all the old protests back: how our beloved original Bangla language, under Westernised influences, is becoming quite unrecognisable. How that a few years later, the Bangla language will no longer remain the Bangla language at all, but some poor mockery of the once rich and eminent lingo. And we become afraid that the only language in history which had to be earned through bloodshed will succumb to the hands of anonymity, or more piteously, to the ignominy of distortion. But looking back at the history of our language, we might find the early forms of it in very different conditions than the formal and proper Bangla we use at present. Our language has its roots in Maghdi Prakrit, which is furthermore a declined form of the Sanskrit language known as the “mother” of all South Asian languages. 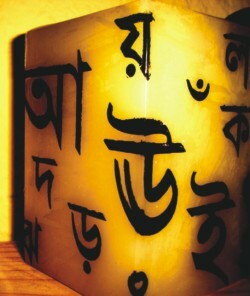 Open a copy of Charyapada, the oldest manuscript written in Bangla and try deciphering the words. Even not going back so far, the works of prominent Bangla writers in the twentieth century can addle your mind to obscurity. Half of the words used at that time are now completely redundant, and the other half has somehow become transformed to fit our everyday usage. Though the general population, the new generation explicitly, has been much blamed for disgracing our language by improperly using it, we must first take it into account: what is the actual Bangla language? The “proper” one? We don't know half of the words that were initially used at the time of its birth. Some of them we have heard or seen, but only from the mouths of our grandfathers or in bekaron books. How many of us say 'chair' by its Bangla name? And how many of us can take up one of Tagore's short stories and read it without once consulting the dictionary? But even our language is not wholly uninfluenced by the dialects of other countries. The Indian Sub-Continent has played guest to Portuguese, Dutch and French travellers. It has also been under the rules of Persian Mughals and the British Monarchs. All these times, under the confluence and mixture of these foreign vernaculars, our language has been incorporated with many foreign words. 'Anarosh' isn't a Bangla word, it is Portuguese. Similarly, 'balti', 'dibba' are not Bangla words either. Numerous examples like these can be cited, yet if you pick up any Bangla dictionary, you are sure to find any of these words there. So how is it that we are constantly being blamed when saying words like 'joss' or 'jhakkas'? There are also many discussions about the so-called fake accents that are now being used by us. Brought into prominence by TV and contemporary music, the ways we now speak Bangla are held in contempt by a large portion of the population (mostly by the people from our previous generations). But how exactly was Bangla spoken a hundred years before? Are we following the exact and upright ways that the pundits from both Bengals had created for us decades ago? We don't even speak Bangla like the West Bengal people. Why, then, is it so contemptible when we pronounce words like 'kheyechhi' or 'giyechhi' as 'khaisi' or 'gesi'? Neither the English, nor the French, nor any other languages in this world have retained the primary and early ways they were either written or spoken. They all have undergone innumerable changes and transformations and thus now have reached the present state. Even now, their vocabularies are being nourished by new words. Some of them have their roots in our own Bangla language. But we are simply trying to shun the onset of changes that are making their presence imminent in our language. A language cannot be created and developed in a day. It takes years and exertions of countless people and also by allowing nature to take its own course, to form and bring a language into recognition. Like society, the verbal system through which society sought to express itself is ever-changing. Society, when left to its initial form and not stirred and welded to suit the needs of its people, becomes dead and useless. Language is very much similar to it. Latin and Sanskrit aren't considered as 'dead' languages for no reason. It doesn't matter how much we condemn the additions of new words or the practices of alien accents. Our language will follow its own course of nature and continue to change. Instead of wasting our breath protesting the heedless use of Bangla in the coming days of February, we can at least maintain an indifferent attitude towards it, regarding the complete uselessness of the act. And change is always for the better, isn't it? Even if it is not, the excitements and intrigues of life would all become eradicated if there wasn't anything new for us to grasp and comprehend. Let's just accept the changes and move forward with our lives this February then, shall we?